Flying with your cat in the cabin might seem scary at first. But take it from us, it is doable and easier than you think. Traveling with your cat in-cabin is much simpler than in cargo, so try not to overwhelm yourself during this process. We have flown with Yoda several times in the cabin and each time was pleasant, calm, and quiet. 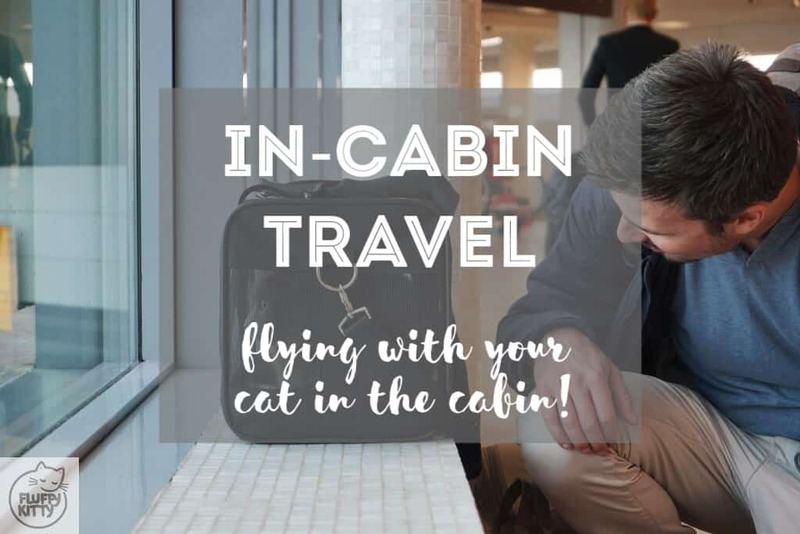 Read more below for our best tips on flying with your cat in the cabin! Do you have a pen and paper ready? Here is what you need to do before flying with your cat in the plane cabin. I find it easiest to search for my information about airline companies and their pet policies online before calling them. This way I have the information in front of my eyes when I do make the call and it allows me to take time to come up with questions I might not think about if I call first. I will make a large guide about all the cat-friendly airlines in the future, but for now, please research your airline company online to read about their pet policies. 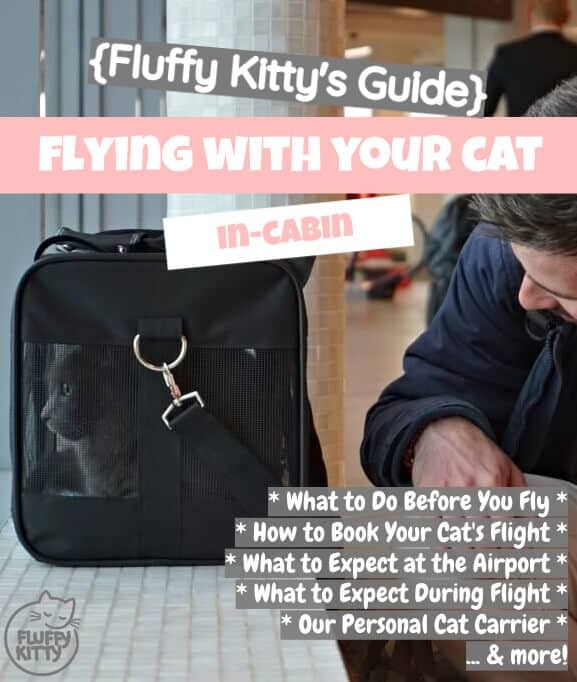 Summary: Research all the necessary information about flying with your cat in the cabin ahead of time. The earlier, the better. Don’t procrastinate! Once you have researched on your own about flying with your cat in the cabin, it’s time to call your airline and make the reservation. It is wise to call in advance to ensure there is space on the aircraft for your cat. I call one month ahead of our departure date to ask questions and verify the information I have regarding cat carrier dimensions, weight, etc., is correct. I take this time to ask about reserving Yoda a spot on the aircraft. You will likely need to give preliminary information regarding your cat’s name, breed, carrier, and weight. Sometimes I’ve paid in advance via the phone using my credit card. Other times I have paid at the airline desk at check-in. Find this information out when you call your airline. Each time I’ve made a reservation for Yoda to fly with me in-cabin, the airline in question told me to call back 48 hours in advance of departure to reconfirm the booking and to ensure there were no complications with the flight. Sometimes there might be a passenger who is allergic to cats or there could be an overbooking in carry-on pets. Some airlines restrict the number of carry-on pets allowed in the cabin, which is why I make sure to reserve ahead as much as possible. This has never happened to us, and I like to think it was because I was always ultra-prepared. Summary: Call your airline well in advance (I recommend up to one month prior, maybe 2 weeks if you’re behind schedule) and ask questions to verify all your information. While Paul and I are very flexible, “go-with-the-flow” travelers, we do not mess around when it comes to traveling with Yoda. One missed document, vaccination, or even a miscalculation in the carrier dimensions could cause lots of unnecessary stress and drama to your trip. Just prepare in advance as much as possible, and you and your kitty will be jet-setters. Collect all the necessary cat travel documents* and all the necessary items for the carrier (more on that below). Verify that the carrier is spacious enough for your cat but that also satisfies airline requirements (which are a pain in the arse, by the way). Prepare your cat for the trip by keeping the carrier out in the open for a month prior to the flight. Encourage your cat to sleep in it and get used to it as much as possible. After all, they will have to get used to it one way or another and you don’t’ want a stressed-out cat when you fly. 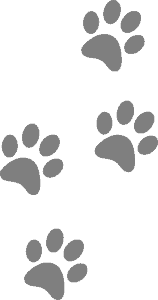 –> *Airlines usually require the health certificate for cats, but this might be for international travel only. I’ve always flown internationally with Yoda, and even on my domestic flight from North Carolina to Pennsylvania, I needed the international health certificate because I was continuing on an international flight afterward. Summary: Don’t procrastinate getting the necessary materials just in case something doesn’t fit right or goes wrong. 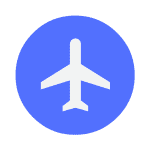 Check with your airline the necessary dimensions and documents you’ll need the day you fly. An airline-approved cat carrier (Get a flexible one – see my recommendation at the end of this article). A copy of all of your cat’s up-to-date vaccinations and the health certificate (I even print out the receipt for his reservation if I paid in advance). A pet pee pad to line the bottom of the carrier. A collapsible bowl to slip your cat some food or water during the trip. Toys are not encouraged as they take up space and it’s not the environment to encourage playtime anyway. I sometimes stick Yoda’s favorite mousey in there though just so he has the smell of something familiar and comforting. A collapsible cat litter box if your cat can’t hold its pee for several hours (hence the required pee pad to keep your cat dry just in case). Summary: You’ll need some essentials if you wish to travel with your cat in the cabin. There are also some additional items you can carry on that might make your cat more comfortable. We arrived at Lyon’s airport (France) at 5 am. We were the first ones, so we took Yoda out to stretch his legs. One thing about traveling with Yoda on board was the security process. 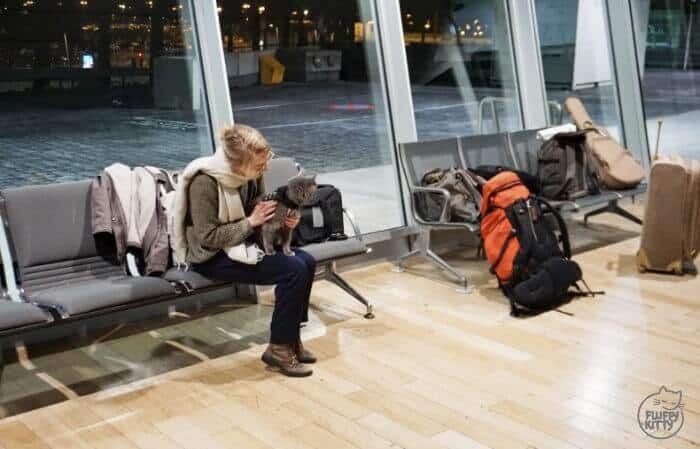 You will need to go through security with your cat. And yes, he or she will likely be a little nervous if it’s busy. This is why I recommend going through security as soon as possible. You will need to take your cat out of the carrier and hold him while walking under the x-rays. Don’t worry, it’s safe. The trickiest part is getting your cat out of a carrier it doesn’t want to come out of. Yoda holds on to my neck pretty tight and I get lots of “Aww, how cute” remarks from fellow travelers. Summary: Take your cat out (when prompted by a security officer) and walk under the x-rays when you go through security. Warning: You might get stared at! Once you pass through security, you can breathe. Go sit in a quiet corner with your cat and stick your hand in there to give him or her some cuddles. Yoda is always hyper alert when he sees so many people running around so we often take an extra t-shirt to cover a side of the carrier to give him some privacy. When you board at the gate, you’ll need to take out your documents to show the staff before entering into the tunnel. One time, when I was flying with Yoda from Portugal to the US, they almost didn’t see I was carrying Yoda and I almost passed without showing my documents. Don’t do that or they quickly get suspicious, lol. Once you find your seat in the plane, settle your cat comfortably under the seat in front of you. It needs to fit underneath the chair properly. We fit Yoda in tail-first, so his head sticks out by our feet. This way we can easily unzip the top of the bag and stick our finger in the carrier to see if he is doing well. He always responds with a loving lick! Summary: Relax in a quiet corner until it’s time to board. Make sure to show your documents when you board, and fit your cat’s carrier comfortably under the seat in front of you. Relax and don’t stress! If you stress, your cat might pick up on it. Also, check on your cat at least once every hour or two, even if it’s to peep down and see if he’s sleeping. Yoda is always sleeping unless we wake him. That being said, if your cat is happy and sleeping, don’t stir him and let him sleep. What if your cat is noisy on the plane? This has never happened to us, ever. Yoda knows it’s not the place to be vocal, thankfully. However, if your cat seems stressed, take out a treat or two, or as many as needed to calm him down. Also, ask for a little water to fill some up in a travel bowl. Your cat is likely to meow for either 1.) food/water or 2.) attention. These are luckily relatively simple fixes. Summary: Soothe a loud cat on the plane by giving treats, food, or water, or by giving attention (cuddles). When it comes to traveling with your cat in the cabin, you want to ensure you have the right airline-approved carrier that’s spacious, comfortable, breathable, convenient, and lightweight. We have been using the Amazon Basics Cat Travel Carrier for our in-cabin flights with Yoda. We have a size “Large” (19.7 x 10.2 x11.2 inches (LxWxH)), and I must admit, the dimensions are slightly larger than most carry-on pet policies. However, it has always been able to fit under the seats since the top is flexible. This is why I stress the importance of having a soft-side cat carrier. We have flown on TAP Portugal and United airlines with Yoda in-cabin using this exact carrier. Sure, there are better cat carriers out there, but I would personally recommend this one if you don’t want to spend too much money on an expensive, fancy carrier. This one is valued at under $30. I briefly touched on this earlier, but the best way to prepare your cat for travel is to allow him or her to get used to the carrier. Take short trips with the carrier to the drive-thru or around your neighborhood. The more you do it, the less of a novelty traveling will be for your cat. If your cat is a kitten, then you’ve lucked out. Kittens are the perfect age to start training them to be travelers. But not all cats are ok with traveling, and that’s important to recognize, too. With that being said, don’t ever try to “force” your cat to get accustomed to flying, or traveling in the car, or to the carrier in general. It will leave a very bad, and maybe unforgettable, imprint that the carrier is not a fun place to go. In addition, don’t use the same carrier for travel as for vet trips. Most cats hate going to the vet, so if you use the same carrier for both travel and vet check-ups, it’s likely your cat will start to hate traveling just as much as the vet. Summary: Introduce your cat to the carrier at the earliest age possible. Take short trips in the car to familiarize your cat traveling in the carrier. And don’t use the same cat carrier for travel as you do for vet trips. If ever you have any more questions about flying with your cat in the cabin, don’t hesitate to reach out. We were also worried and stressed for Yoda’s well-being the first couple times we traveled. In fact, that never goes away. We just learn how to be better prepared for the next trip! Thanks for reading this guide to traveling with your cat as a carry-on. Our much-loved fluffy friends deserve as much love and peace as possible, so don’t forget to calm down so that your cat can feel calm, too. Always offer head rubs and licks of water or treats off your finger throughout the journey. Above all, if you read this guide and it helped you personally travel with your cat, please let us know and share the article with others. We’d love to hear from you!